From October to November of 2012, a large number of ancient tombs were found during the Jin-Ma expressway construction from the Jinhu county to the Maba town of Xuyi county. Under the approval of State Administration of Cultural Heritage, Nanjing Museum and Xuyi Museum combined a joint archaeological team and carried out a salvage excavation to the ancient tombs discovered during the construction. By the end of the excavation in November, 2012, there were 196 tombs excavated in all, including 176 tombs dating to the Han dynasty and 20 tombs from the South and North Dynasties to the Tang and Song dynasties. 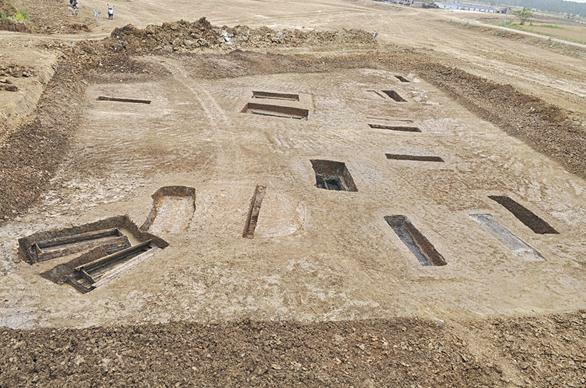 The Han tombs in this excavation were all located outside the ancient Dongyang city site dating to the Qin and Han dynasties and were one part of the Dongyang Han tombs complex. The tombs were mostly preserved well without being robbed. There were over 2000 pieces of artifacts unearthed, including bronzes, irons, lacquers, jades, stones, glazes, potteries and so on. Among the 176 tombs dating to the Han dynasty, the majority were rectangle earthen pits. According to the burial furniture, these tombs could be classified into three types: tombs with one outer coffin and double inner coffins, tombs with one outer coffin and one inner coffin and single coffin tomb. M30 was located in the northwest outside the outer town of the Dongyang city. It was rectangle earthen shaft tomb and its opening was 3.4 meter long, 2.48 meters wide and remained 1.05 meters depth. This tomb was filled with tessellated soil between the tomb opening and the top of the outer coffin chamber, while between the side board of the outer coffin and the pit wall was green paste mud. This tomb had one outer coffin and double inner coffins. The outer coffin chamber was located in the center of the bottom of the pit and was combined with the south coffin and north coffin and the west side chamber. The outer coffin chamber was rectangle in plain. It was 3.09 meters long, 1.86 meters wide and remained a 0.85 meters height. The two inner coffins were in the center of the outer coffin chamber. They were both U-shaped with back boards on both sides and made of a whole lumber. The north coffin was 2.36 meters long, 0.78 meters wide and 0.65 meters high except the cover. In all, there were 50 pieces or groups of artifacts unearthed, including bronzes, irons, jades, glasses, lacquers, potteries and others. Among them, lacquer face masks, lacquer cases, iron swords, iron cuts and bronze mirrors were unearthed from the coffin, while the lacquer ear cups, lacquer plates and potteries were unearthed from the side chamber. Among the unearthed artifacts, the necklace from the south coffin was the most exquisite. The necklace was very rare because the whole necklace was made of 工-shaped jade, gourd shape and toad shape glaze, bear shape amber and round tube shape agate. 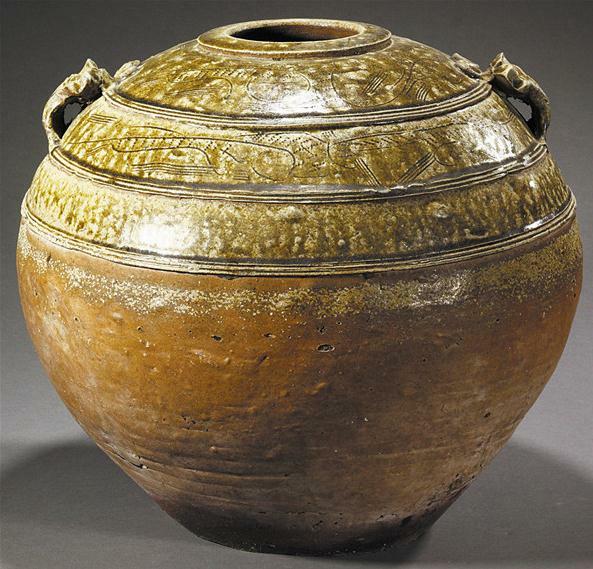 These unearthed artifacts showed that M30 could be dated to the Xin-Mang Period. M72 was located in the east outside the Outer town of Dongyang city. This tomb was rectangle earthen shaft tomb with a 2.1 meters depth and its opening was 2.5 meters long and 1.8 meters wide. This tomb was filled with tessellated soil between the tomb opening and the top of the outer coffin chamber and had one outer coffin and one inner coffin. The outer coffin chamber was located in the center of the bottom of the burial pit and was 2.5 meters long, 1.8 meters wide and 1.2 meters high including the cover. The inner coffin was located in the west of the outer coffin chamber and it was 2.3 meters long, 0.8 meters wide and 0.9 meters high including the cover. There were lacquer pillows and lacquer cases unearthed. The side chamber was located in the east of the outer coffin chamber and it was 2.5 meters long in south-north direction and 0.6 meters wide in east-west direction. Most grave goods were unearthed from the side chamber, including glazed potteries, lacquers, wooden wares, bronzes and so on. The glazed potteries included 2 ding鼎tripods, 2 he盉vessels, 2 bottles,2 bu瓿vessels. Lacquers were mainly ear cups, plates, cases and so on. The wooden wares were mostly tomb figures. In addition, there was a set of precious architecture drawings on the west side board of the side chamber. 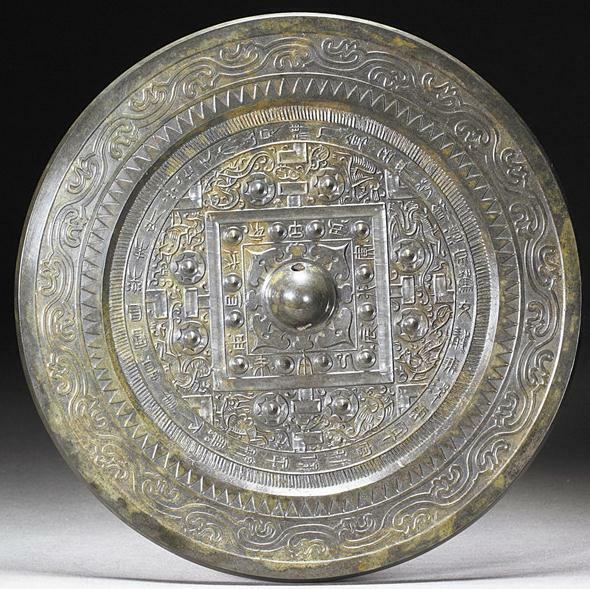 From the assemblage of the grave goods and their type, M72 could be dated to the middle West Han dynasty. M114 was located to the north of the outer town of the Dongyang city. It was rectangle earthen shaft tomb and its opening was 6.8 meters long, 3.9 meters wide and 3.2 meters deep. This tomb was filled with tessellated soil between the tomb opening and the top of the outer coffin chamber. It had one outer coffin and double inner coffins. The cover of the outer coffin was not heavily rotten. The outer coffin chamber was located in the center of the bottom of the tomb and it was 3.5 meters long, 2.4 meters wide and 1.2 meters high including the cover. The two coffins stood side by side in east-west direction and were laid in the north of the outer coffin chamber. The inner coffins were preserved well and were made of a whole lumbers, in which iron swords, lacquer cases and so on unearthed. The side chamber was to the north outside the outer coffin chamber and close to the north side board of the outer coffin chamber. The side chamber was 2.4 meters long in east-west direction, 0.8 meters wide in south-north and 0.9 meters high including the cover. The main grave goods were glazed potteries and lacquers. Glazed potteries were 2 bu vessels and 2 bottles. The lacquers had many types, including ear cups, plates, zhi卮vessels, cases, si笥 cases and so on. In all, there were 30 pieces of grave goods. The embryos of all lacquers were filled with hessian. Inside and outside the lacquers wares were painted with red drawings, which were mainly cloud and deity animals. In summary, M114 could be dated to the middle West Han dynasty according to the unearthed artifacts. On the inner side of the second top board of the outer coffin chamber was a group of rare astrology map. It is the second set of wooden astrology map in Jiangsu province, having important significance.